On a Friday night in late December, the light spilled out of the massive windows illuminating the wintery exterior of Frank and Sherry Knott’s unique residence on the Western edge of Spokane’s Liberty Park. 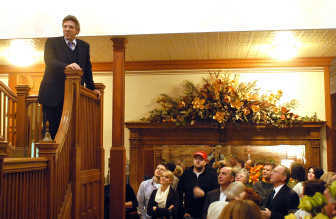 The building, a former power transfer station for the streetcar system in early Spokane, is now a warm and antiques-filled home, and for this event it was the scene of an invitation-only reception for acclaimed singer Thomas Hampson. Hampson, who considers Spokane to be his hometown, was back to perform in the newly renovated Martin Woldson Theater at the Fox. Guests included Spokane Mayor Mary Verner, Spokane Symphony conductor Eckhart Preu and fiancé Neeley Hall as well as other local arts benefactors and supporters. Basking in the spotlight and the warm glow of the roaring fire that filled the oversized fireplace, Hampson introduced his family and praised symphony supporters for the feat of bringing the Fox back to life. The following night, to a near-capacity crowd, Hampson filled the theater with his rich baritone as he performed classics and crowd favorites. The collaborative efforts and hard work of the community to reclaim a local treasure, and the distinguished talent of Hampson as he brought to a close the grand opening festivities of the Fox, perfectly illustrated the power of the individual to make big dreams come true.